While it is true email cuts down on the use of paper, email takes electricity to run. If the electricity is generated by water, wind and sun – great – very green! It helps to use electronic equipment with an Energy Star rating to save electricity. Popular Subscription Services uses electronic equipment, like copy machines, with the Energy Star to save electricity. The copy machine has an energy saver feature that engages when the machine is not in use. We've updated our software, and our continuing to do so, that will save countless reams of paper while giving you more accurate information and in a more timely fashion as well by providing all invoices as PDF files via email and through the website. You can still opt for the old try and true method of a hard copy as well. What are we doing? The three R’s: Reduce, Reuse, and Recycle. As a corporate entity we are actively recycling paper, magazines, cardboard, plastic, aluminum, steel, and glass. We continue to recycle electronics such as monitors, floppy discs, hard drives, power back up units, batteries, microwaves, printers, fax machines, telephones, etc., previously at annual electronics recycling days, and going forward at the facility on Hitchcock Road. We take burned out fluorescent bulbs to hazardous waste collection days. It helps to use electronic equipment with an Energy Star rating to save electricity. We work with PUBCO Incorporated (http://www.pubco-printing.com/) for our printed marketing materials. PUBCO promotes the use of rubber based and soy based inks instead of oil based inks when possible. PUBCO also recommends the use of papers with recycled content. PUBCO also works with Safety Kleen to properly remove old inks, solvents and chemicals. We lease a building that has a Duro-Last roof which reduces heat absorption. The windows are thermo pane which reduce heat and cooling loss and have shades for the same reason. We have been phasing in compact fluorescent bulbs where possible to save energy. Glass block is used extensively in the building to utilize natural light to reduce energy consumption. What else can we do? Small things like turning down the thermostats in the winter and turning thermostats up in the summer. Conserve paper towels by using one. Conserve the use of water at the sink. Use the back sides of paper faxes for in-house copying and printing. Continue to purchase Energy Star rated electronics. Ride our bicycles to work once a week. Plant a tree every year! 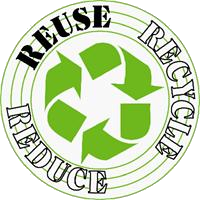 Everyone of us has the ability to recycle and can do so doing some of the items that we do above and in addition here are some ideas to help out.